Sometimes navigating from one point to another is as simple as mindlessly following the docile tones of your GPS app. Other times, both Lewis and Clark – and Vasco da Gama for good measure – wouldn’t be able to lead the way through sufficiently intricate terrain. For accounting professionals swimming the complicated acquisition waters in the oil and gas industry – for both operated and non-operated properties – necessary navigational aids fall somewhere between a new GPS app and a colonial Portuguese explorer. In other words, such waters are in no way insurmountable but, right as rain, you need to know your way around. 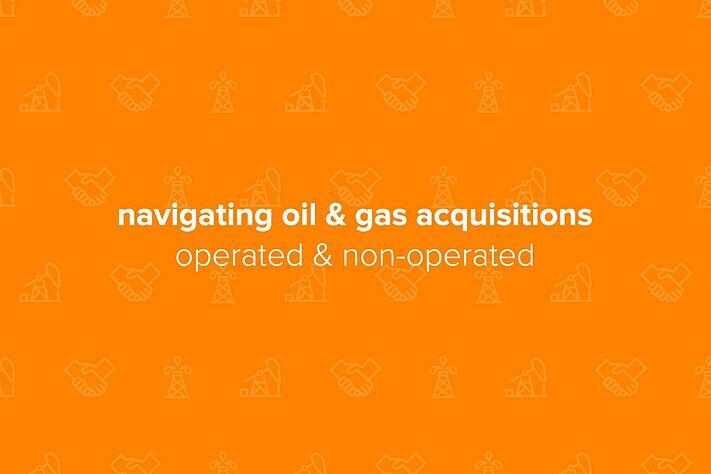 Fortunately for you, our upstanding financial kin, Embark knows its way around oil and gas acquisitions and is here to help guide the way. We assure you that, like many things in life, the semantics of the space might be a bit intimidating at first but are absolutely nothing you can’t handle with confidence and tenacity. Just remember, however, that New Coke was nauseatingly sweet, Columbus thought he had found a new route to India, and the Red Sox ditched Babe Ruth to finance a Broadway musical. In other words, mistakes can happen so be deliberate, understand the terrain, and let Embark be a flashlight in the sometimes dimly lit world of oil and gas acquisitions before you step in mud while wearing your brand new, patent leather shoes. Obviously, given the need for some sort of ownership – either operated or non-operated – in an oil-producing well or wells, acquisitions lie at the heart of the oil and gas industry. In fact, in order to play catch-up in an extremely crowded and competitive marketplace, it's not uncommon for companies to make multiple acquisitions each and every year. As such, for newer or smaller companies that lack the monolithic army of accountants of their older or larger brethren, acquisitions can be a daunting and demanding process that stretches already thin accounting resources. If you find yourself continually facing this sort of predicament, you absolutely must make sure the selling company is sending you all pertinent information and, perhaps even more importantly, that the seller is accurately presenting what your company is acquiring. Of course, acquiring the actual property and needed information from the seller is a critical initial step but, in the end, just the beginning of the process. It is incumbent upon you to also make sure the acquisition information makes it into your accounting system in an organized, clean, and suitably formatted fashion. Yes, this is often as tedious as you might imagine so keep a bottle of aspirin within arm’s reach. Throughout the data entry and migration, you'll also want to conduct completeness checks to ensure accuracy and precision. For instance, taking a mere five minutes before an upload to verify the number of wells on your purchase agreement can save an awful lot of heartache in the future. Also, remember the more information and documentation you have upfront, the easier your job will be throughout the process while also keeping an uplifting smile on the usually stoic faces of the private equity firms. As a very slight aside, with so much riding on an efficient and smooth acquisition process, it's always in your best interest to decide if it's necessary to spend more up front on outside assistance – whether in the form of a software company or consulting group – to help you with the process. Trust us when we say this is not an instance where you want to be pontificating on hindsight being 20/20 at some point down the road. Given the seemingly countless different nuances seen throughout the many oil and gas systems, ignorance is definitely not bliss nor a proper excuse for mucking up the works and setting things up incorrectly. In other words, have a healthy understanding of your limitations and don't hesitate to call in the cavalry if needed. Delving specifically into the non-operating property side of the spectrum, be certain not to fall into the common trap of thinking you don't need to know much information upon acquisition of interest in a well simply because your company is not involved in its operations. In fact, as a rule of thumb, you will often need just as much information on a non-operated property as you would with an operated property. Obviously including non-operating property acquisitions, a critical best practice is to make absolute certain you always set up everything properly the first time to avoid any future accounting catastrophes. To provide a real-world context, Embark recently helped a company with accruals stemming from many months worth of owed expenses on wells from which they hadn't yet even received all of the pertinent information. In order to catch them back up, we had to help them manually piece together all of the data in spreadsheets – a somewhat horrific procedure that could have been completely avoided if they would have automated the process from the very beginning. In order to prevent such issues in the future, Embark took the proverbial bull by the horns and set up an automated process to receive needed information on a consistent basis so such issues would never be repeated again. In other circumstances, non-operating property owners will simply wait for checks to arrive from the field rather than be proactive in their approach. To avoid these circumstances, Embark suggests taking the initiative to facilitate a more immediate distribution of information. Non-operated companies must understand their interest and request production reports so they can estimate what their revenue will be rather than waiting on a lagging check that could take months to appear. Although you'll obviously want to be similarly deliberate with operated properties to ensure everything is correct from the beginning, unlike non-operated properties, operated properties warrant careful attention towards both revenue and expenses. Also, as the operator, you are responsible for billing all other owners as well as dispersing revenue to those owners in a timely fashion. Likewise, you are also likely responsible for complying with production and severance tax reporting requirements. Therefore, operated properties could very well require more upfront attention and effort to ensure complete and accurate information from inception. As such, whoever is migrating acquisition data must be extremely well-acquainted with both oil and gas accounting as well as the nuances of your accounting system in order to set up the special scenarios that will inevitably arise. As foreboding as it might sound, any wrong step along the way – be it in billing, revenue, taxes, or a whole host of other possibilities – can create a cascade of potential cash flow issues that can trigger an unnecessary and unwanted administrative burden to straighten out. Rather than participating in such blatantly masochistic behavior while simultaneously wasting everyone else's time, patience, and gentle disposition, do yourself a favor and hire someone from the very beginning that knows what they're doing and can make you look like a hero in the process.